Under-tile heating is a floor heating system designed primarily for existing homes with either cement or timber floors where the heating is provided by in-screed cables. This type of heating is often known as ‘direct acting’ due to its ability to heat up quickly. 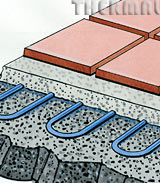 Under-tile heating may also be called ‘in-screed heating’ because the cables are not installed within a full concrete slab, but rather covered with a cement-based screed.